This wasn’t our plan. 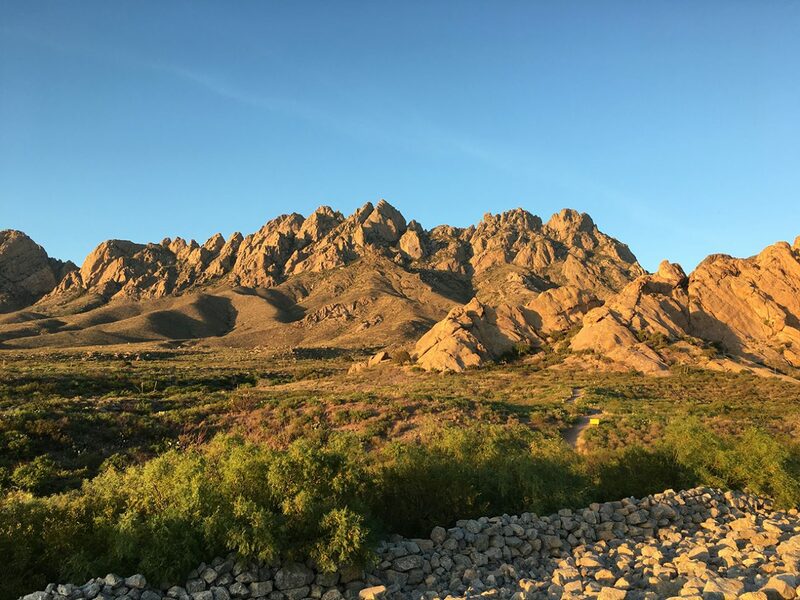 We were supposed to leave Santa Fe and head up into Utah but the weather wasn’t cooperating with us so we changed our plans last minute and found a great little boondocking spot in Las Cruces at the base of the Organ Mountains. This is where my desire for a drone increased ten fold. I am so anxious to be able to truly capture just how amazing these places are that we are visiting. The Organ mountains were just screaming at us... “I can’t believe you don’t have a way to capture our beauty!” I know, I know...I’m trying! When we were on our way to Las Cruces, the idea popped into my mind to just try to go the whole month of May without paying for a campsite. Why not? We have all the gear to be able to run what we need to (hello, solar!). We have two 5 gallon jugs that we can haul water to the rig. We can do this! We got this! #NOPAYMAY (you may have read about it here). Every night we were treated to a beautiful sunset. And often, the sight of grazing cows out our window. Most of our time was spent catching up on things and enjoying the cooler weather. We hiked at the near by Dripping Springs Natural Area which was really pretty. The hike up to the cave was breath taking (except for the many, many bugs flying around our faces). We were treated to this view from the top! We went on a longer hike that landed us at an old sanatorium and exploring old house and hotel ruins. Just down the road we found another hike (New Mexicans are fit, y’all) that supposedly would lead us to a waterfall. Sweet, it was a hot day and playing in a waterfall sounded perfect! Guys...we got to the ‘waterfall’...it was literally a drip running down that dang rock. I mean, really? We need a waterfall to play in. It wasn’t even enough to get our hands saturated. It wasn't even worth getting a picture because you wouldn't be able to tell it was there! It was a good hike though. Such a beautiful area and it was interesting enough (towards the middle of the hike) to really hold the kids attention and not bore them to death. Our kids hate easy hikes where you’re just walking on a flat surface and I agree, that’s boring. We need rocks to climb over and slot canyons and a certain level fear to keep our interest in the hike. This one passed with flying colors! We arrived in Las Cruces just a couple days before May and on May 2nd we celebrated 2 years of being nomads! It has been the hardest and most rewarding 2 years of my life. We have laughed and cried and screamed and been overwhelmed with so much love and joy. Living in a tiny house on wheels isn’t for everyone but it’s for us and we love it. It is really amazing how little we really need. Living with less has been such an eye opening experience. It actually makes me sick to think about much money we wasted when we lived in our huge house. Not only on the house but everything we bought to fill it up. All the ‘things’ that we ‘needed’ was just so unnecessary. Now, let me tell you. I do miss having a place to decorate (and the garden, I really miss my garden). It’s really hard for me not being able to paint rooms again or move around furniture. We had a really, really great house. We just realize now how much of our lives were wasted keeping up with it. On our Nomadiversary, we took the day off from work and asked the kids what they would like to do to celebrate our 2 year Nomadiversary and they all were for going back to White Sands National Monument. No complaints here! We love that place. It’s so special. I could stand in that sand all day! The deeper your feet go in the softer and cooler the gypsum sand is. It’s just so fun to play in. We spent a full 2 weeks in this sweet boondocking spot and we enjoyed being only 15 minutes from town but far enough away that it felt like we were in the middle of nowhere. The only slightest bit of complaining I have that our ‘neighbor’ up the way liked to run his generator...a lot! But honestly, he was far enough away that it wasn’t a huge deal. If he had been closer, we would have left. The joys of having a home on wheels! Oh! I nearly forgot! A whole bunch of our time here in Las Cruces was spent working on a new project! I can’t wait to be able to show you but for now...here’s a hint! Guys, this life we live is not perfect. It’s not all sunshine and rainbows. I just want you to know that we have bad days just like everyone else. Heck, did you know we’ve been driving around without trailer breaks for much longer than I care to admit? (We still haven’t found the problem.) Anyway, we just share our travels as a way to remember the places we have been and to hopefully help someone else who wants to explore the area. Thanks for taking time out of your day to read about our family’s adventures.